Paula Dunn is the Head Coach to the GB Paralympic Track & Field team who came back from the Rio Games with their biggest ever medal haul, a whopping 33 medals (15 Gold, 7 Silver, 11 Bronze). Appointed as Head Coach in 2013, Paula has also lead the team to some of their most successful World and European Championships over the last 3 years. A former sprinter having represented Great Britain at the 1988 Seoul Olympics and with a number of Commonwealth and European Medals to her name, Paula still has one of the fastest times in British sprinting history, ranking in the top 10 times of all time in the 100m and 200m. Congratulations on an incredibly successful Paralympic Games; can you share with us your experience of being out in Rio and what was your first Head Coaching experience at a Games like? I actually loved it. It was a really good experience, really enjoyable. It was a combination of four years of hard work, from when I took over in 2012. I’ve done two IPC Athletics World Championships, two Europeans, two Commonwealth Games, so this felt like the final one for us. It was really enjoyable, nerve wracking, but enjoyable. What was it like being the head coach at your first Paralympics? I have been in the role for the last four years and I’ve been Head Coach at the 2013/2015 World Championships which was a really important landmark for us in terms of where we were in the cycle, it didn’t feel unusual, which was positive. Obviously, I was totally aware it was my first one and we’re part of this massive big organisation and we’re part of the BPA [British Paralympic Association] and not just the national governing body. It was really good; I did feel really supported by so many people along the way who have been involved since 2012. It was really good, I really enjoyed it. It went well too, that makes even better to be quite honest. It was phenomenally successful wasn't it? It was really, really good. I don’t know what I’d be saying if it wasn’t so good! I always say to people you get a slightly biased view because I don’t know what you would say about your experience if you hadn’t hit your target! I hope I would have – I’ve been saying to everybody I really want you to go and enjoy Rio. You don’t know what’s going to happen in four years’ time, so I want to make sure that I just really enjoyed the experience. Is there one particular performance, athlete or moment that stuck out to you the most, or, if your allowed to have one, a favourite moment or performance? Oh, gosh. That is a difficult question, there were so many highlights. I think what made me feel that this was going to be a really good Games, was probably day two in the program. We had a day where we had a number of finals, and we were able to win all those finals. The day when Sophie Hahn won the gold, Georgina Hermitage won the gold medal; Jonnie Peacock won a gold medal, and then followed by Libby Clegg winning a gold medal. So we had four gold medals on day two. That was like, “WOW!” I realised that we could possibly beat our target! That was kind of one of those days where you walk out of the stadium and you’ve got all your plans and you’ve seen all these athletes develop, so to go there and see them actually win on the biggest stage, it was a really good feeling. Just before the start of the Paralympics, there were concerns in the media of classifications for the athletes within ParalympicsGB been wrongly classified. For those coaches who are not involved with disability sport, can you briefly explain the process an athlete goes through in order to get classified and how does ParalympicsGB along with other teams ensure they are classified correctly. Classification of all international para-athletes is handled exclusively by the International Paralympic Committee. UK Athletics is not responsible for the classification of any of our athletes competing internationally. The system is a highly complex one, involving a very wide range of physical conditions and requiring detailed analytical processes. However, we are confident of the classification of all British athletes who were competing in Rio and we always cooperate 100% with the IPC to ensure that all GB athletes are correctly classified in line with international rules. Moving onto you as a coach; having had a very successful career as a sprinter, was coaching something you always wanted to go into after retirement? Probably not, when I was competing there was no lottery support, so I always worked and had my day job as a sports development officer. I always coached as part of my job. When I finished my career there was no real plans to then go into coaching, but there was a gap at the local athletics club and they wanted me to look after a group for a few weeks. I offered my services thinking it was a few weeks, which fortunately for me, I ended up doing that for like 10 to 12 years! Initially, I kind of fell into it but I did coach outside of the sport and I did netball and just basic athletics to primary and secondary school children. I probably had some of the skills I just didn’t recognize it, so when the opportunity came I was really lucky. I was mentored by my coach for the first few years and then I developed my own philosophy and then I went ahead and did what I did. How did you get involved with disability athletics? I coached the female sprinters and a couple of male sprinters and there was a disabled athlete in the region Graeme Ballard who was a sprinter and I was just asked could he come and train with our group. That was my first experience really of coaching an athlete with a disability. I didn’t see it as anything difficult, I just had to do is see things differently in terms of how I made him the best he could be with his issues in stability and balance so that’s what I did. So again, I just fell into that side of the sport. 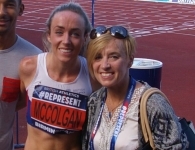 When you were appointed in 2013, you became the first female Head Coach in British Athletics history - was that something on your mind when you took the job? You know what I didn’t think about it until everybody told me I was the first one, first female and the first black person. Up until then I hadn’t really thought about it. For probably for the first year I actually thought oh my gosh, such a lot of a pressure but then I just decided, that you know what, I’m just going to relax, I’m just going to be the best I can be and hopefully that will be enough. There is, an expectation, there is a little bit of pressure on you, what I don’t want to do is, I don’t want them fail in this job to make it difficult for the next female that comes along. You’ve always got that in the back of your mind which you probably shouldn’t do but you do. If I fail then they might think, ‘well we’re never going to employ a women again because of what happened with Paula!’ Which is really not a nice feeling. Once I realized literally I got the job not because I was female or because I was black, it was because I was the best person for the job. I then just calmed down and thought, they trusted me with the role, I have got the abilities to do the role and I just went with it. I just decided to be me. Even though athletics as a sport is a 50 / 50 split of female and male competitors, why do you think at a coaching level there is such a big difference in genders with a huge lack of female coaches? We definitely need more female coaches; nobody’s going to say that’s not the case. We do try to encourage more women to get to the top, I don’t think there is such an issue at the lower end of the sport but once you get to the top of the end of the sport we don’t have as many women. In our team, out of the team of 22 staff we had female physiotherapists, we had female coaches, female team managers, so we try and make it equal with our staff. We do go for the best person obviously but we do have a high portion of women in terms of key roles besides the coaching roles. Coaching is very, very individualised and the athlete makes the decision who coaches them, it’s not us who make that decision. I have seen a lot of female coaches out there now and I suspect the next cycle the percentage again will increase of female coaches coaching athletes. I don’t think it’s just athletics, I think it’s across the board, we need to keep pushing. But coaching is a tough, tough job at any level. I fell into it but the reality is that I was an athlete first so I was used to being out of the house six days a week and juggling a job. If you’ve got a family, you’ve got a full time job, you’re down at the track four or five times a week, and when you’re a mum and you have an expectation that you’re going to look after your children, it’s a hard gig to do. It’s a really tough one. How do you manage the role of being a Head Coach alongside being a mother? Does having to be away from home for such long periods of time such as you did in Rio get to you? It’s really difficult, sometimes the balance is out of kilter, sometimes you know you’re spending more time in work than you are in your family – but you’ve just got to make sure the majority of the time overall is balanced between your work and family life. It’s really, really important. I travel away weekly, so I work away two or three days a week and then I’m away for weeks on end at camps and competitions. I think I’m really fortunate, I’ve got a great partner and I’ve got great family support but it isn’t easy. In my mind I always have this internal battle, do you want to be a great mum, do you want to be a great at your role, do you want to be a great partner? You do all those roles and you’ve just got to accept that at certain times that you can’t be great at everything across the boards. Some things have to dip at certain times. Right now I’m investing a lot of time with my family and my son and make sure he feels loved. I mean he always feels loved but in my mind I’ve got to do something a bit more because I have been away and really busy for the last six weeks. It gets so difficult though, but it’s more an internal battle with yourself. If I asked my family they all say, oh you’re brilliant. It’s me convincing myself that I’m not short changing the family because of the job. Then when I’m away with the family then I also have to convince I’m not short changing the job because I’m away with the family. It’s this internal battle. I think most people have it, but probably most women have it a little bit more. I have heard before that some coaches see working with a Paralympic team as a stepping stone to working with an Olympic Team - how to you view this and would it be your ultimate ambition to move over to the Olympic Team? You know what, that’s a really good question. I came from the Olympic side and that’s where I was employed to do things like talent identification. I’ve done team management etc, but this job is a really important role. It brings in funding from UK Sport just as the Olympic program does. If this was the pinnacle of my career, I would be very satisfied. I don’t feel as though I need to do the Olympic job. I’m just generally really happy where I am at the moment. People may say ‘oh well she needs to do that’ but in my mind I don’t. I’m actually quite content here because I know it’s a very demanding job. The fact that we’ve got our best results since 2000 and the reality is probably our best results ever because the sport has changed and the numbers competing at so much more higher and different. I think that in itself is really positive. It shows that this sport is evolving quickly. In para-athletics, over 100 nations were competing in Rio and of that, over 30 won gold medals.